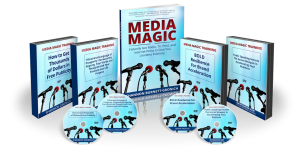 Purchase your MEDIA MAGIC book today and receive free shipping along with a BONUS MP3 of Copywriting Secrets by Leading Marketing Guru, Jay Abrahams. Shannon Burnett-Gronich is known as the owner of a “Million Dollar Rolodex” and the Author of “MEDIA MAGIC: Instantly Get Radio, TV, Print, and Internet Press to Give you Limitless Publicity.” Shannon has successfully attained over $3.1 MILLION DOLLARS in free Publicity for her clients and written the book “Media Magic” in order to lead business entrepreneurs into generating their own publicity- for free! 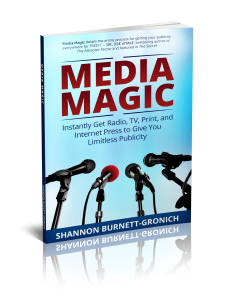 Shannon saw the need to develop the MEDIA MAGIC book in order for people to not only learn “how” to get their information out there- but to also get their “desired” information out into the press. MEDIA MAGIC teaches ordinary people how to communicate within the industry to become a highly regarded “Expert” in their field. Learn the key to proper Press Release creation, creating “Promotional Buzz,” and writing a Power Biography that proves extraordinary are all within the pages of MEDIA MAGIC- Along with more bonus marketing material and insider information. MEDIA MAGIC also comes in a HOME STUDY COURSE.